OnePlus’ latest flagship is here, and with it, a few changes also arrive. Gone is the audio jack, but new is the in-screen finger print reader – one that works well, and looks cool. The 6T also packs in Qualcomm’s latest Snapdragon SoC, 6 or 8GB of memory, and 128 or 256GB of storage. It also ships with Android 9.0, helping to deliver a truly up-to-date smartphone right out-of-the-box. One of the reasons OnePlus shot to popularity so fast with its original device is because it offered a no-nonsense Android OS. It had some OnePlus apps, but overall, the bloat has been minimal, fairly close to stock Android – save for those exclusive OnePlus apps. The 6T doesn’t break any rules here: Android 9.0 “Pie” is clean as a whistle, with minimal apps installed (and most that are, are directly related to Google.) The home screen is preconfigured with Google shortcuts and a simple date widget. You can’t tell from the static screenshot, but the background seen is actually a live background, so it moves ever so slightly as you use your device. The most in-your-face OnePlus software feature is “Shelf”, a one-stop shop that can be found when swiping from the left on your home screen. Here, you will be able to find your recent contacts and apps, the weather, storage and memory information, and even a location for storing membership cards (the camera can scan to add them). There’s really not too much to say here, because there are no big changes between the 6 and 6T. I did find the new “About phone” screen in Android Pie to be useful, though, since it gives you a quick overview of the phone’s stats and other bits of key information all in one spot. Plus, it has a picture of the phone you’re using. Yo dawg. Most of the performance listed here was pulled from the OnePlus 6 review, although the 6 had some tests re-run just to verify that software updates didn’t magically improve performance since that last bench session. Notes: In GFXBench, the Adreno 630 ran the tests at 2280×1080 (OP6) and 2340×1080 (OP6T), while it ran them at 2046×1080 on the Adreno 540 (OP5T). All results represent the highest score achieved across multiple runs. All devices were running up-to-date software. The OnePlus 6T offers almost identical specs to the OnePlus 6, so a difference in performance was never expected. Instead, this testing was largely done as a sanity check. In some cases, the OP6 performs better than I could get the 6T to, but blows were traded all over. Ultimately, benchmarking is sporadic, even if more than one run is conducted. Android sure could use a proper “benchmarking mode”. Ignoring the OnePlus 5T for a moment, the 6T is leagues better overall, thanks in large part to its newer Adreno 630 GPU. With the kind of performance offered on the Snapdragon 845, the wait for what Qualcomm will unveil next is pretty exciting. Even if performance kept the same, power consumption will continue to go down, so it’s a win overall. It’s a win-win if the GPU happens to perform better while using less power, but we’re not always that lucky. Having used the OnePlus 6 for a while, moving onto testing the 6T was about as natural as a move could get. As soon as I wrap-up benchmarking a device, I continue setting it up to match my previous device as much as possible. That’s not just for familiarity’s sake, but also to see how my work-flow changes with the software and hardware changes. 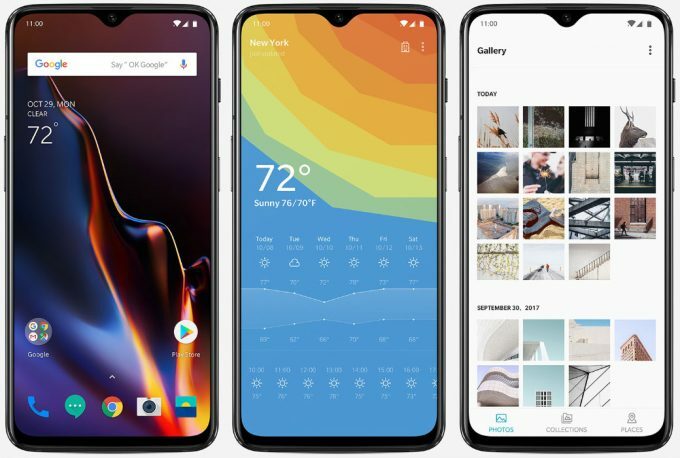 Because the OnePlus 6 received an Android 9.0 update not long before the 6T released, there was effectively no difference in software between the devices. 6T saw the ushering in of OnePlus’ new “Nightshade” feature, which follows all of the others by allowing users to take better night photos. This requires you to keep as still as possible, and wait for a handful of seconds. I don’t have great photos to share (look here for photos taken with OP6), but I’ve been impressed enough with the Nightshade feature the handful of times I tried it (on OnePlus 6), but it simply won’t compare to the likes of Pixel 3, which was recently infused with a ridiculously good night mode feature. That phone also has a better camera to begin with, and therein lays the main thing you give up with OnePlus: a top-end camera. Whenever someone asks me if OnePlus is worth going with, the answer is an obvious yes. 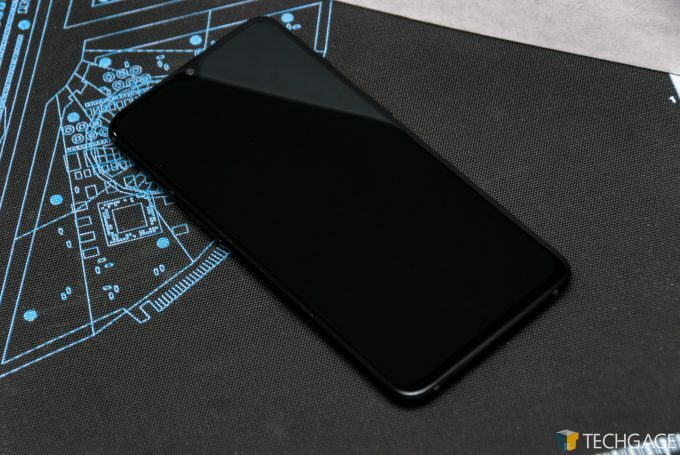 The company continues to offer a lot of value with its phones, and the design and build quality is fantastic, so I’ve had no problem recommending its phones. Of course, things change with the 6T if someone is insistent on an audio jack, but the number of people that affects will continue to dwindle. Ultimately, the camera is the only sticking point I can ever give people: if they truly care about taking quality photos while on-the-go, higher-end phones are going to fill the need better than the current OnePlus flagships. That all said, OP’s cameras take great photos in the day time – it’s only at night when things can get a bit hairy. When I was in San Francisco earlier this month, I was taking night photos with the OP6, while a friend was taking photos with his Samsung Galaxy Note 8. While the 6’s Nightshade feature took about 10 seconds to capture a photo, the Note 8 captured a much clearer and brighter image a lot quicker. Nonetheless, I don’t at all mean to suggest that the OnePlus cameras are bad; it’s just that for this photo-lover, they do leave a bit to be desired. But at the same time, I’d personally still go with OP because of the value the phones pack, because in the grand scheme, they still take good photos. In moving from OnePlus 6 to 6T, two major changes are inherited. First is the fact that there is no audio jack, but that’s a point I’ve talked enough about. You either care about it, or you don’t. The second thing is the finger print reader, which is under the display. Fortunately, despite this cutting-edge tech, I’m happy to report that its performance has been quite good for me. As you might expect, this in-screen reader isn’t as quick as those typically found at the back. I can unlock the OP6 quicker than I can the 6T with the same thumb, but that’s not really what this change is all about. This is about convenience, and in a way, simply having a cutting-edge feature. Whenever a finger print is needed for authentication, an icon appears on the screen where the reader is, and as it’s touched, it animates to let you know that it’s reading your finger print. The overall authentication process takes a moment to clear, and overall, it’s worked great for me. The animation is also cool enough to look at that it warrants showing friends how you unlock your phone, or even touching it wrong on purpose just to bask in its blue-green aura. 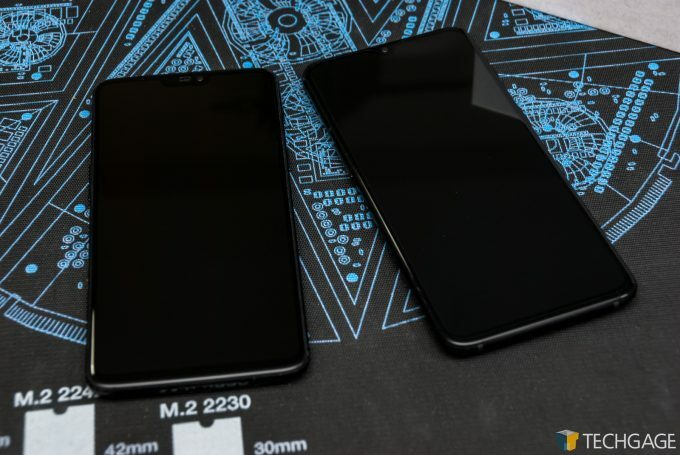 As mentioned earlier, the notch is another notable change between 6 and 6T, and after having used the 6T for a couple of weeks, I now believe that the teardrop notch is the best I’ve seen. I even like it more than the standard circle seen on the Essential phone. It looks… classier? Or at least subtler. The 6T certainly isn’t a phone that anyone using a 6 should upgrade to. It’s the same internal hardware for the most part; it makes a lot more sense to wait for the OP7, or whatever the first 5G phone from OnePlus will be. We’ll likely learn more about this soon, as Qualcomm will be hosting its third annual Snapdragon Tech Summit in Hawaii next week. CES will come soon after, at the start of January, so it’s only a matter of time before we get a better idea of how the 5G rollout will play out in 2019. In the end, the OnePlus 6T gets a recommendation from me just as the OP6 did. OnePlus continues to offer great value in its smartphones, and if the biggest complaint I have is that the camera isn’t as good as phones that cost hundreds more, then I’ll take it. I am forced to ignore the removal of the audio jack a bit, because it seems obvious that it’s going to become a rare feature at some point. I’m just thankful that a simple adapter can remedy that, even if it means the phone can’t be charged at the same time. That all aside, the OP6T has pretty much everything else going for it. It’s the phone to beat at its given price point. Packed with Qualcomm’s fastest Snapdragon (845) and Adreno graphics (630). Great design, and lots of official options for cases. In-screen finger print reader isn’t the fastest out there, but it’s the coolest. Beautiful screen with pre-applied protector. Includes free basic transparent case – a nice touch. Equipped with the latest Android (9) out-of-the-box. Excellent battery-life (thanks in part to the large 3,700mAh battery). For what it counts, the 6T has a great-looking notch. No wireless charging or water-proofing.